Who took out all those mortgages, again? 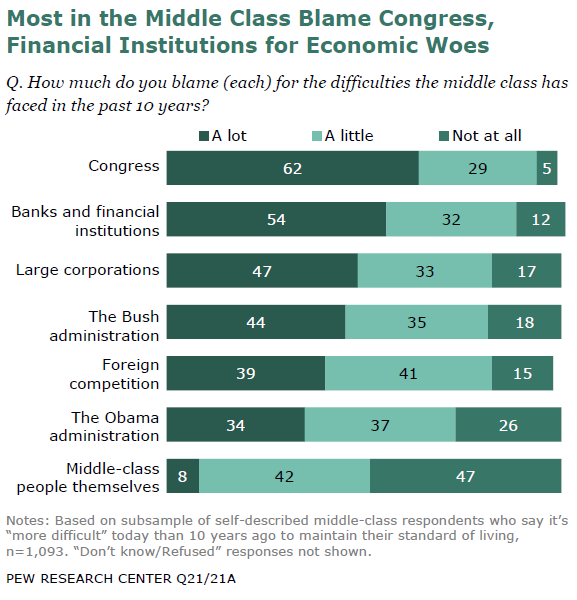 So a large proportion of actual middle class Americans don’t see how they might have played a role in some of their own misfortune. Without trying to demonize people who may have been victimized by shady lenders or bad circumstances, I don’t think that speaks well for the country’s understanding of what happened during the last decade. In other words, there was no tradeoff between liberty and security. There was just a loss of liberty. If you follow the economic policy debate in the popular press, you would be excused for missing one of our best-kept secrets: There’s remarkable agreement among economists on most policy questions. I’ve never seen the disjunction between the political debate about economics and the consensus of economists be as large as it is today. For what it’s worth, I do agree with the main point of the article – that public commentary about economics is studiously uninformed and caricatured. Generally economics takes a backseat to ‘sexier’ social issues, which is certainly a problem. But the fact that there is a consensus amongst economists despite a huge number of questions about the nature of economic arrangements across the globe which cannot be answered by neoclassical economic theory should indeed be a matter for concern – about the academic discipline, as well as about the public discourse. In the 1970’s, there was a healthy debate between a great number of economic schools – Austrian, neoclassical, Marxist and the various flavours of Keynesian. Long story short, the neoclassicals (and a few Austrians) essentially rent-sought their way to pre-eminence, and have been doing their best to hold barred the academy doors against the quantitative alternatives (ecological economics, post-Keynesianism and chartalism, distributism) for near-on three decades now. The consensus is an imposed one, and the debate within mainstream economics now is essentially a quibbling over minutiae between straight-up neoclassicals and neoclassicals masquerading as Keynesians. That should probably raise a few red flags, given the trenchant empirical criticisms of many of the assumptions made by neoclassicals about human behaviour and rationality, about the nature of resource consumption, about the role of institutions and so on. These aren’t ‘squawking heads’ on television making these criticisms; more often than not these are serious scientists and statisticians (Herman Daly, Dean Baker, Dan Ariely, EF Schumacher and his followers).